South Main Street and Orkney Springs Grade, Mt. 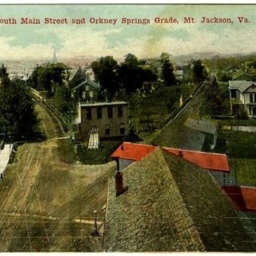 Jackson Va.
Postcard with a picture of the original location of the intersection of Main Street (Valley Pike) and Orkney Springs Grade in Mt. Jackson Virginia.